(2) telescope collecting area x f.o.v. WFCAM is composed of four Rockwell Hawaii-II 2048x2048 18 micron pixel array detectors, with a pixel scale of 0.4" (f/2.4) and a field of view per exposure of 0.21 square degrees. Each detector is divided into quadrants, each of them divided into eight channels of 128x1024 pixels. The detectors are spaced at 94% of the detector width. 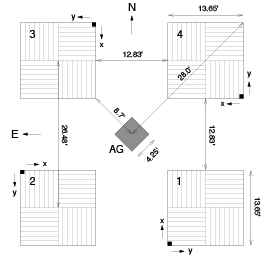 Four exposures are required to survey a contiguous area (tile) of 0.8 square degrees. WFCAM has eight filter housings including the broadband set ZYJHK and two narrow band filters H2 and Brγ. The eighth filter housing is blanked for darks. Although the nightly data volume is quite variable, the average is about 2200 images (~140 Gb) with peaks of ~3600 (~230 Gb). The following table lists the main properties of the WFCAM filter set. Magnitudes are quoted in Vega. For more information and the filter profiles go to the filters documentation in our technical section. CASU is responsible for the processing of all data obtained with WFCAM. The data ships to Cambridge in LTO-I tapes as single extension FITS files. All the data is read onto RAID disks and converted to MEF format - ie. one FITS container file for all 4 detectors. If you have any problems concerning CASU software please email casuhelp _AT_ ast.cam.ac.uk.